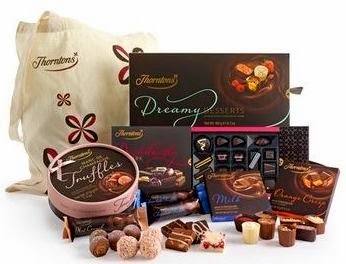 FOODSTUFF FINDS: Win - Thorntons Chocolate Hamper!!! The lovely folks from thorn tons wanted us to highlight their fantastic range of hampers available on their website. There is something for everyone, with different occasions and different budgets. They have also very kindly offered to give one away as a prize for Foodstuff Finds readers as a competition prize. In order to enter you need to follow this blog via Email, Twitter, Pinterest or Facebook (all the links are on menu on the right). Liked and shared .... I love chocolate!!!!! !